Wide view of the Security Council Chamber. The United Nations Security Council today condemned the ballistic missile launches conducted by the Democratic People’s Republic of Korea (DPRK) on Monday, 5 September. “The members of the Security Council deplore all Democratic People’s Republic of Korea ballistic missile activities, including these launches, noting that such activities contribute to the Democratic People’s Republic of Korea’s development of nuclear weapons delivery systems and increase tension,” the 15-member Council said in a press statement, which noted that the launches were in “grave violation” of the country’s international obligations under various resolutions it has adopted. In the statement, the Council members also expressed serious concern that the DPRK conducted the latest launches after a series of earlier ones – held intermittently on different occasions between 15 April and 22 August – in flagrant disregard of repeated Council statements. 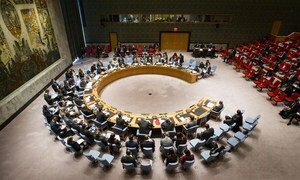 “The members of the Security Council reiterated that the Democratic People’s Republic of Korea shall refrain from further actions, including nuclear tests, in violation of the relevant Security Council resolutions and comply fully with its obligations under these resolutions,” the Council noted. In the statement, the Council members said they further regretted that the DPRK is diverting resources to the pursuit of ballistic missiles while it citizens have great unmet needs. The Council also called upon all UN Member States to redouble their efforts to implement fully the measures it had imposed on the DPRK, particularly the comprehensive measures contained in resolution 2270, which among other points, expands arms embargo and non-proliferation measures, including small arms and light weapons, and enforces new cargo inspection and maritime procedures, including mandatory inspection on cargo destined to and originating from the DPRK. The Council also called on UN Member States to report as soon as possible on concrete measures they have taken in order to implement effectively the provisions of resolution 2270. The Council members stressed the importance of working to reduce tensions in the Korean Peninsula and beyond, and reiterated the importance of maintaining peace and stability there and in north-east Asia at large, while also expressing their commitment to a peaceful, diplomatic and political solution to the situation. The United Nations Security Council has strongly condemned the Democratic People's Republic of Korea's (DPRK) launch of a ballistic missile from a submarine on 23 August, which follows a series of recent tests and launches the Council said is a “grave violation” of the DPRK's international obligations and “in flagrant disregard” of repeated calls to halt such activity.